The 76 mm Gun Tank T92 is Rank IV American light tank with a battle rating of 6.7 (AB/RB/SB). It was introduced in Update 1.53 "Firestorm". It's most unique feature is its cannon which is not fully housed inside the turret allowing for a very low profile and good gun depression. 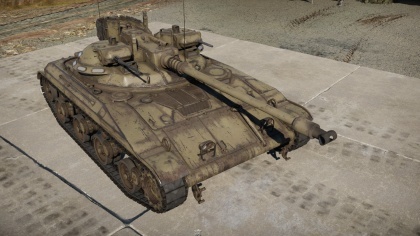 The 76 mm gun has been improved with a better ammo selection than the M41A1 Walker Bulldog. The rear of the gun breech has a layer of 15 mm tracks on it. 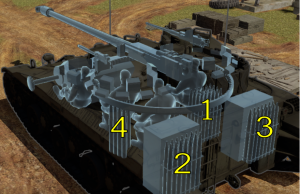 Ammo racks of the T92. The T92, as a light tank, can perform as an adequate reconnaissance tank in the battlefield, using the low profile the weave through small cover that most larger tanks cannot exploit. The 76 mm cannon also allowed for a great ambush weapon with its great gun depression, with the 76 mm having access to a HEATFS and APDS rounds. Like most light tanks however, with only around 40 mm of effective frontal armour, the T92 cannot take any abuse larger than a 12.7 mm machine gun round so any possible return fire should be avoided, even though the Hull Break mechanism does not affect the vehicle. HEATFS shell that can penetrate 254 mm, effective even against later Rank V vehicles. The M41 Walker Bulldog light tank, though a great performer in its task, suffers from a considerable weight that causes issues with air-transport and air-dropping of the tank to the battlefield. A development program was made to replace the Bulldog with a tank that is much lighter to allow it to be air-dropped into the battlefield. The prototype vehicle, designated the T92, was to be the replacement for the Bulldog. The first pilot model left the assembly line in 08 October 1954. 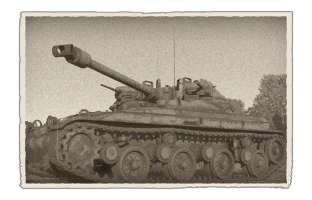 The T92 was a very unique design in comparison to the M41A1 Walker Bulldog. The design had a very low profile turret, and the turret had two rotatable cupolas with machine guns for the crew to fire from. At about 18 tons, it was considerably lighter than the 23 ton M41A1 Walker Bulldog. The design used the same gun as the Bulldog as well, and the gun functioned on a semi-automatic loading system that allows for fast firing with the tank. The interior could hold 60 main gun rounds, with each firing ejecting the spent shell casing out of the tank to prevent cluttering of casings in the tank interior. Armour on the tank is rather comparable to the M41A1 Walker Bulldog at about 0.5 inches on the front armour plate, though made out of lighter materials like aluminum for weight-saving. The vehicle is powered by a Continental V8 AOI-628-I engine that gives 340 horsepower. The engine was also moved towards the front of the vehicle rather than the rear for additional protection, making room for an escape hatch for the crew on the rear of the tank. Maximum speed recorded for the T92 was about 56 km/h (35 mph). The T92 tank was good enough to be considered for mass production, which was planned for 1962, but this did not come to be. In 1957, during the test trials of the T92 with the second pilot model, the discovery of the Soviet PT-76 and its amphibious operation had Congress ask for the same thing in the light tank design. The T92 was unable to be adapted with the ability to perform amphibious operations, and thus the T92 was cancelled in 1958, being replaced by the M551 Sheridan that is capable of air-dropping and amphibious operation with a flotation screen.